Context. Apart from the Olivet Discourse in Mark 13:3–37, the sacred author’s grouping of parabolic material in Chapter 4 constitutes the largest unit in his Gospel devoted entirely to the teaching of Jesus. 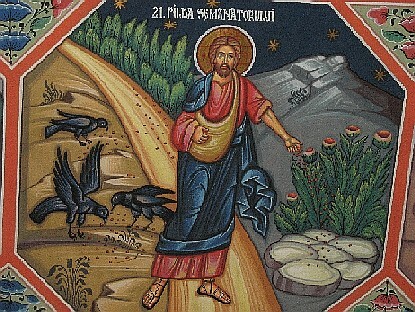 Included are three parables of growth: the sower (Ch. 4:3–8), the growth of the seed (Ch. 4:26–29) and the mustard seed (Ch. 4:30–32). Each of the three reflects upon sowing, growth and harvest-elements which illumine the character of the Kingdom of God signaled by Jesus’ presence among them. Yet there is a climate of unbelief that swirls around Jesus: many simply do not appreciate Jesus, the Jewish leadership seems bent upon destroying him (3:6), and he has been accused of forming an alliance with Beelzebul (3:22). Still, the parables not only reflect the situation all about Jesus, more importantly they point to the inevitable and ultimate triumph of the Kingdom of God. One notable feature of this Markan chapter occurs in early in the chapter when Jesus begins the parable with “Hear this! A sower went out to sow…” (v.3) and then closes the teaching with “Whoever has ears to hear ought to hear.” (v.9) While ending a parable with a plea to discern is typical of the presentation of many parable, the doublet that bookends the first parable of Mark 4 is highly unusual when compared to the traditional Jewish presentation of the masahal/parable. Most scholars take this doublet as an expression that in the hands of Jesus, parables were intended to provoke thought, and were not the transparent illustrations they are sometimes supposed to have been. While this can also be said of the contemporary Jewish use of parables, there is perhaps a dual purpose. First, not only to provide a depth that separates the Spirit-led discerns from the merely curious, but, secondly, to provide an intended degree of obfuscation to investigating Jewish authorities. This entry was posted in Scripture and tagged 11th Sunday B, mustard seed by Friar Musings. Bookmark the permalink.